Discussion in 'In The News' started by Coss, Sep 5, 2018. Today we will review a few improvements to the interior, as well as its standard features. As we continue to focus on the next round of funding, this week’s Momentum is from the archives and takes a look at the ergonomics of the Elio. Certain statements in this email including, but not limited to, statements related to anticipated commencement of commercial production, targeted pricing and performance goals, and statements that otherwise relate to future periods are forward-looking statements. These statements involve risks and uncertainties, which are described in more detail in the Company’s periodic reports filed with the SEC, specifically the most recent reports which identify important risk factors that could cause actual results to differ from those contained in the forward-looking statements. Forward-looking statements are made and based on information available to the Company on the date of this email. Elio Motors assumes no obligation to update the information in this email. 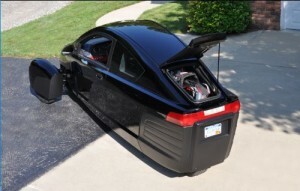 As we continue to focus on the next round of funding, this week’s Momentum is from the archives and takes a look at the ergonomics of the Elio. The term “ergonomics” rarely works its way into our daily vernacular, but it’s a word that we experience every day. Basically, ergonomics refers to the comfort and ease of use that both driver and occupant(s) experience while inside a vehicle. The terms are intertwined: if a driver’s seat is comfortable but the window controls are in an inconvenient location, the vehicle has poor ergonomics. With our sleek styling and unique configuration, the exterior of the Elio garners the lion’s share of the attention, but the ergonomics of the Elio are paramount to an enjoyable Elio experience. Today we will review a few improvements to the interior, as well as its standard features. The front seat of the vehicle is a 6-way manual seat with dual density foam which allows for a comfortable driving experience. Our engineers have enhanced the passenger’s experience by lowering the bottom of the rear seat and adding more foam, which has created an additional .75 inches of head room. 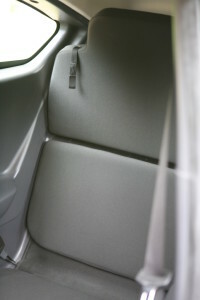 Additionally, the rear window areas have been rounded, which has increased the visibility for the passenger. The interior lighting which will be used for entering and exiting the vehicle has been upgraded by moving the light up from the right B-Pillar to the headliner (inside roof). To combat outside noise and provide a quiet ride, we have increased the sound deadening material used in the dashboard and floor of the vehicle by adding foam to these areas. This will significantly reduce Noise, Vibration, and Harshness (NVH). In addition, we have added insulation to the headliner of the vehicle. The material of the interior will have both deep and shallow grains. Deep grains are more pleasing to the eye while the shallow grains are used in areas that make it easy to keep the vehicle clean (think high touch areas). The standard color of the sidewall (below the beltline, which is from the bottom of the side windows) trim is black, while everything above the beltline is a medium gray. 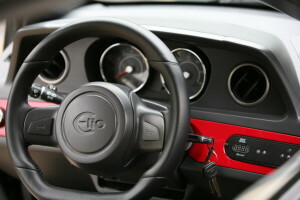 Of course, through ePlus: My Elio, My Way, there will be many customization options available for the interior. The Elio’s interior comes standard with a child seat LATCH, which has been a priority from the beginning. For the passenger’s enjoyment, we have added a USB port in the rear. With today’s power demands, easy access to a power source provides a more enjoyable ride for both driver and passenger. In the Elio, the rear seat folds down for improved trunk space when there is a need for extra space. The rear seat has been redesigned to lie flatter and support more weight. Additionally, carpeting has been added to the trunk space. The exterior of the Elio may command first consideration, but the vehicle’s interior ergonomics are essential to a positive driving experience. While everyone else is turning their heads to catch a glimpse at the sleek Elio navigating the roadways, its occupants will be perfectly comfortable, while looking straight ahead. I know there are folks out there with slide rule in hand, calculating the loss of MPG, with the recent news of additional weight by the addition of carpet in the "trunk", better sound insulation. and an added USB port :-) 84mpg, not, now 83.75?!! It's 83.793. Get your slide rule calibrated! Or it could be because the gas has gotten crappier. It was just a joke because the carpet added weight. I all-ways try to look for the silver lining,,, but this line, "As we continue to focus on the next round of funding",, makes me wonder if it means that Paul is on top of somebodies house nailing shingles down, and he is lookin forward to payday. Yes, I figured as much …. duh! !